Hop – gives a bit of hope. I know I’m going to get skewered for this — but that hasn’t stopped me so far. So, here it goes: I REALLY wanted to hate this movie. Its pedigree was not promising. Director Tim Hill was responsible for Garfield 2: A Tale of Two Kitties and Alvin and the Chipmunks. That in itself deserves a kidney punch. The animation studio, Illumination Entertainment created Despicable Me, which was not a bad first attempt, but they weren’t running on the level of Pixar or Dreamworks (but, then again, who is?). This film somehow barely avoids crossing the event horizon though, and doesn’t get spaghettified in the black hole of children movie failure. I think the combination of Russell Brand’s delivery, effectively attractive character designs, beautiful animation, and absolutely spot-on technical achievements in blending the CG into the real world, actually makes for a compelling film experience. Sure, there are downsides. James Marsden feels like he’s been miscast as the young man who still lives with his parents and can’t find a job. Its like the casting director for 90210 was involved: “No one will ever notice that James is 38 and still living with his parents, who are only 13 and 16 years his senior” And the character never grows up beyond his Peter Pan-ish mentality — he just finds a career where he can remain that way. There are prerequisite musical numbers with CG characters, which are always meaty tasks for animators, but they always make my hackles raise. Fortunately, Hop keeps them short, and one dancing character is, in fact, integral to the climax of the story. Pop culture references are surprisingly and thankfully scarce, which will extended the shelf life of the movie. Humor is much more self-effacing rather than pointed at other characters. Brand sticks with his child-like rockstar persona, but, like his humor in his stand-up material, his dialog seems immature but has this subtext of intelligence. Cameo by David Hasselhoff shows that he can make fun of himself. Hank Azaria brings his Birdcage accent back (inside joke wordplay?) 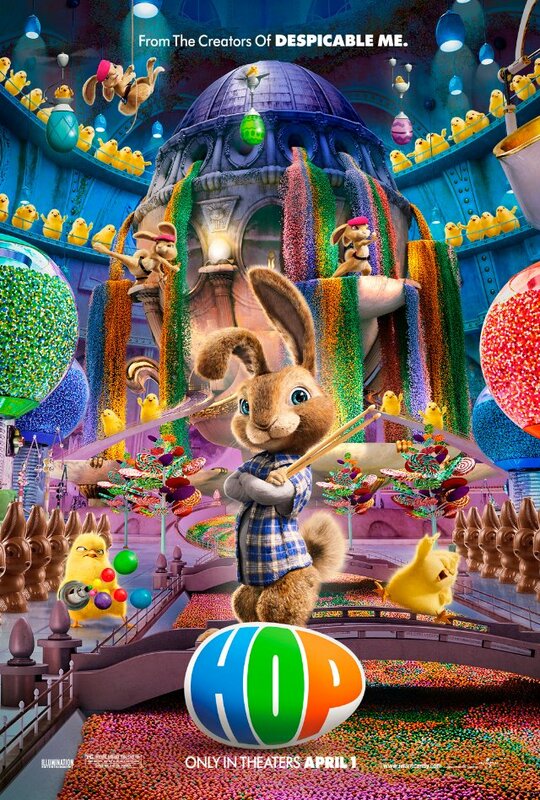 as the inexplicably Mexican chick who runs the Easter Island candy factory and has aspirations of being the Easter Bunny himself in a very strange subplot. Its not the best movie I’ve seen in 2011, but certainly not the worst. Its actually better than most other films of the same Children Live-Action/CG Hybrid sub-genre. And I felt a little tinge of nostalgia because of memories of Rankin-Bass holiday stop-motion animation from my childhood.